Stop covering up your hair loss—fix it with Keranique® Hair Regrowth Treatment! 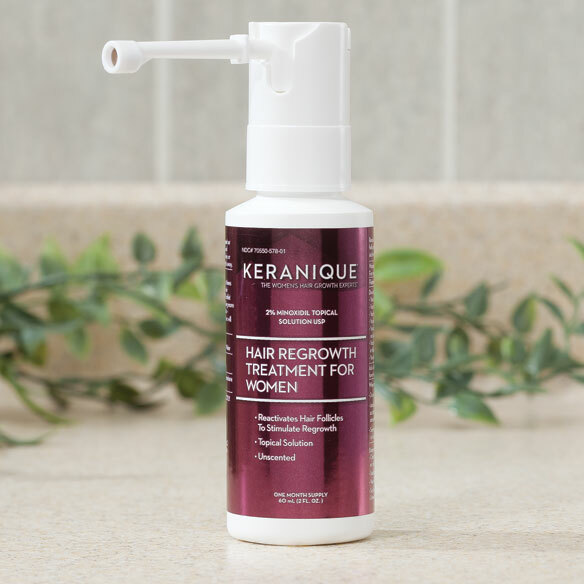 Keranique® hair loss treatment contains 2% minoxidil, a highly effective option that can successfully treat hair loss at the source: your hair follicles. Keranique® is the only proven hair loss regrowth treatment available without a prescription, offering a convenient, affordable option for restoring the healthy hair of your youth. Keranique® reviews show a high rate of customer satisfaction, with the majority of users reporting noticeable improvements with consistent use. Enjoy renewed confidence and a more youthful appearance by treating your hair loss with one of the top treatment products on the market. Keranique® Hair Regrowth Treatment includes a unique needle nose applicator, so you can easily and accurate apply the product to target areas. For best results, apply 1 ml. of this hair loss treatment twice daily, directly onto scale. Product contains 2 fluid oz. Active Ingredient: Minoxidil 2% w/v (in each 1mL dose). 3. Spray (6) pumps directly onto the scalp at your area of thinning hair or hair loss. Apply twice a day. 4. Make sure Women’s Keranique Hair Re-growth Treatment with 2% Minoxidil Spray comes in direct contact with the scalp. The formula will not work if it is sprayed only on your hair and does not reach your scalp. Women’s Keranique Hair Re-growth Treatment with 2% Minoxidil Sprayer is a child-resistant sprayer pump. Using more or more often will not improve results. Continued use is necessary for hair re-growth, or hair loss may begin again. I am having hair loss so I want to give this a try. to help the other to stand out so when my freinds ask me i will give them the reason how good it is. I have a bald spot on the top of my hair. Using this every day helps reduce the appearance of my bald spot and it does make some very fine hair grow back. Hope to regrow hair in balding spots. I received the Healthy Living catalog and I read the information about this product. I need to strengthen my hair making it look fuller and more luxurious. My hair is thinning out and I am looking for a product to help me solve this problem. I would like to know if this product promotes hair growth. Will this also help with itching? My scalp itches like crazy at times where my hair thinning so badly. BEST ANSWER: Thank you for your question. No, this will not help with an itchy scalp. We hope this information will be of help to you. Does this work to help thinning long hair? BEST ANSWER: Thank you for your question. You may need to use this product 2 times a day for at least 4 months before you see results; the amount of hair growth is different for each person. Please note, this product will not work for everyone. We hope this information will be of help to you.